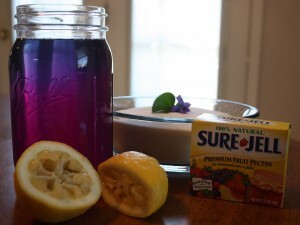 While researching violets, I found several references to homemade violet jelly. It looked beautiful, but I wondered… would it taste like you were eating a mouthful of flowers? That didn’t sound all that appealing to me. Regardless, I decided to try it out basing my experiment on a recipe for mint jelly. My first batch tasted delicious! Everyone loved it, only it didn’t set up; it was more like syrup. I did some research online and compared all sorts of recipes and came to the conclusion that I had too high of a liquid to pectin ratio. So, the making of batch two ensued. It turned out perfect. Though the flavor is difficult to describe, most of the people that I had taste it described it as grape-ish, myself included. Just a note: Violets have mild laxative properties when eaten in excess. So please enjoy this jelly in moderation! 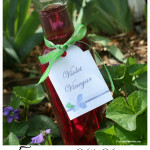 First you’ll want to make a violet infusion just as we did when we made violet soap. 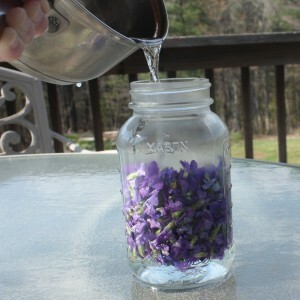 Gather two to three cups of violet blossoms and pour 2 1/2 cups of boiling water over them. The mixture will begin to turn aqua then eventually a deep blue or purple depending upon the shades of violets used. 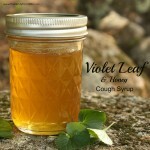 After the violets have infused for a sufficient amount of time, strain and add the juice of one lemon. Now, you’ll make the jelly just as the Sure-Jell pack instructs. Mix the pectin with the flower/lemon mixture, stir over high heat until it reaches a heavy boil. Boil for one minute then add the sugar all at once. Keep stirring, return to a boil for one minute. Remove from heat and quickly ladle into prepared jars. Process in a water bath for five minutes. Remove from water and let sit for 24 hours. 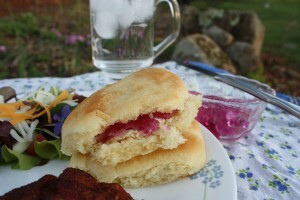 Serve with hot homemade rolls and enjoy! Tagged edible flowers, jelly, violet jelly, violets. Bookmark the permalink. This is so incredible! I love the color of the jelly! It is … so violet! lol! I’m guessing you picked the violets? Any idea if I could get any online anywhere perhaps? NERDS ARE AWESOME! Holy cow! I didn’t even know violet jelly was a thing! I get tons of violets in my yard. As soon as spring comes to Milwaukee, I am going to try this. Too cool!!! Thanks for sharing! Ooooo! Can you share the dandelion jelly recipe too? sounds wonderful and looks beautiful. What type of violets did you use and do you know where they sell the flowers or petals if you don’t grow them? Could you use honey instead of the sugar? this looks so fun i know my preschoolers will love it!!! Hi! I love this idea! Could you freeze the flowers if you don’t have time to do the whole jelly process? I saw you suggest freezing dandelion flowers for later use once. Or maybe freeze the infusion? 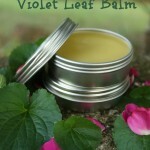 I was also wondering about use violet flowers in the salve or lip balm. If I wanted to do that should I use fresh or dried? We still have some blooming around her and I dying to try something with them! I also kind of want to save the for use later but wasn’t sure how to do that best. Thank you so much for your beautiful blog posts! Hi Diana! Yes, violet flowers freeze very nicely. You can also freeze the infusion, just as you would juice for making other jellies such as grape, etc. You could try drying the flowers to use in lip balm and salve. I haven’t experimented with that aspect much, but I don’t see why it wouldn’t work! I like to use dried or at least flowers that have wilted overnight so that most of the water is evaporated out. Some people do fine using fresh flowers/herbs in oil, but in my experience it gets a little sludgy and the risk for mold & spoilage is much higher. Oh sorry, one more question! What oil would your expend to use if you don’t want a smell from the oil? (Like if you were making lip balm that was going to be close to your nose or a solid perfume.) is there a really light smelling olive oil perhaps? Thank you! My favorite light oil is sunflower oil. It should have no real smell to speak of. I read a study a while back showing that sunflower was more helpful for damaged skin than olive oil, so have switched over to using it in most salves & lip balms. this is so great, amazing what we can do with things we have growing all around us. Hi Gail, Mine are just common purple ones, as shown, for the most part. There are a few darker ones that grow at the edge of my woods (first time spotting them this year) and mingled in with the common purples are some white with purple faces. I use them all equally. Yours sound fine to use, but to be sure you could do a search to look them up and make sure your flowers are in the viola family. Does your brother have a website or FB page where he shares any of his recipes? 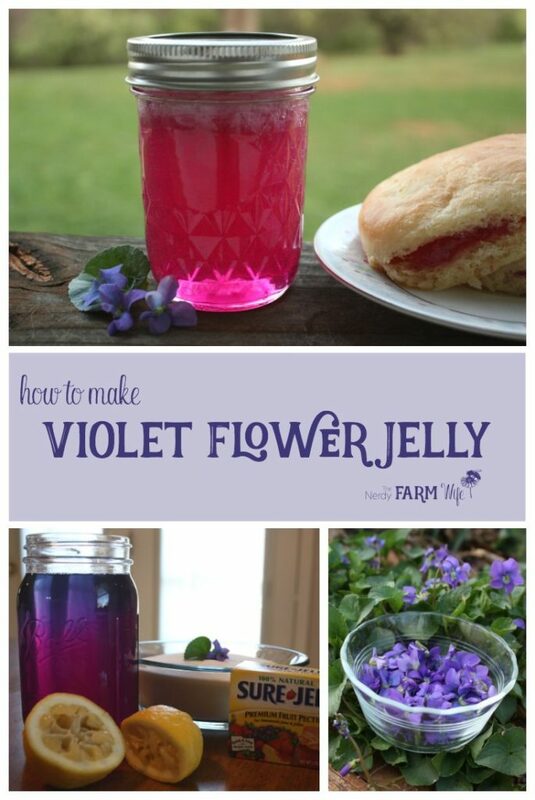 I made this violet jelly and everyone that has tried it, loves it. I am going to try the sunflower jelly, and want to do the dandelion as well. I am not sure how to go about getting all the petals off the dandelions without drying them first. As they wilt pretty quickly after picking I feel like I would need lots of helpers to try and pick, get the petals picked or cut off, and into a jar for the hot water in any timely manner. Does he use fresh petals or dried? I would love to see more recipes of his, if he has them available anywhere. Thanks for everything that you do! The violets that grow in my yard are very small and most are white…are they okay to use in this recipe? Hi Megan, That’s a good question! I would think you could, since all members of the viola family are edible as far as I know, but you won’t get the pretty purple-pink color. How wonderful to have a yard full of violets, and dandelions too! They are two of my favorite medicinal weeds – lots you can do with them. I hope your jelly turns out well! Hi Rita! Yes, you can freeze violets. There are a couple of options. First, you can just put them in freezer bags, spreading them out in a flat/single layer as you go and pressing much of the air out of the bag. Let that freeze flat and then it’s easy to take out what you need, when you need it. You could also freeze the flowers on cookie sheets first, then transfer to a freezer bag. That’s a little more time consuming though. 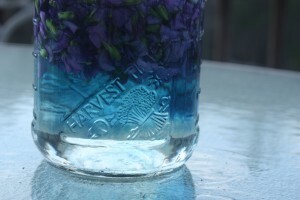 I’ve kept frozen violets for 9 months to a year before using – they keep their beautiful color nicely. Use them straight from the freezer, without thawing first or they’ll tend to turn to mush. You can also make up the violet juice (infusion) for jelly and freeze that in plastic containers like you would if saving grape or berry juice to make jelly with later in the year. 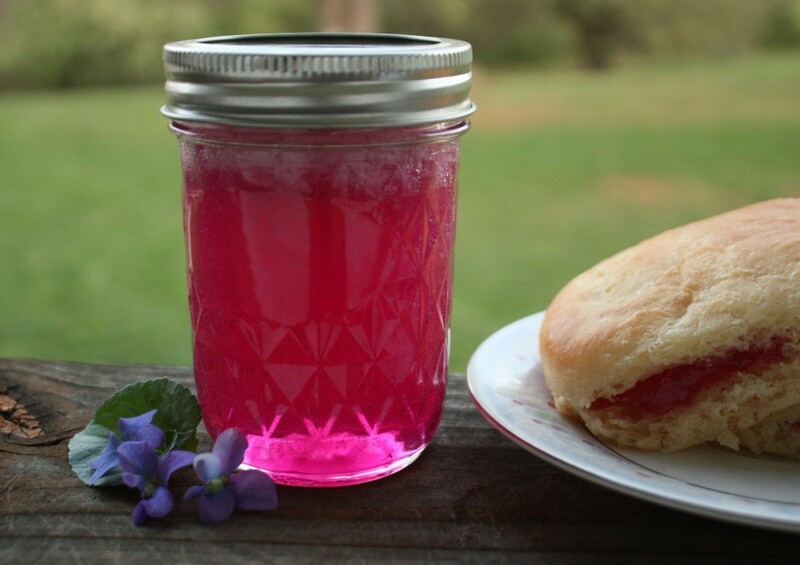 When ready to use, thaw it in the refrigerator overnight and finish making jelly with it the next day. The juice (infusion) should stay good about 9 months to a year as well.